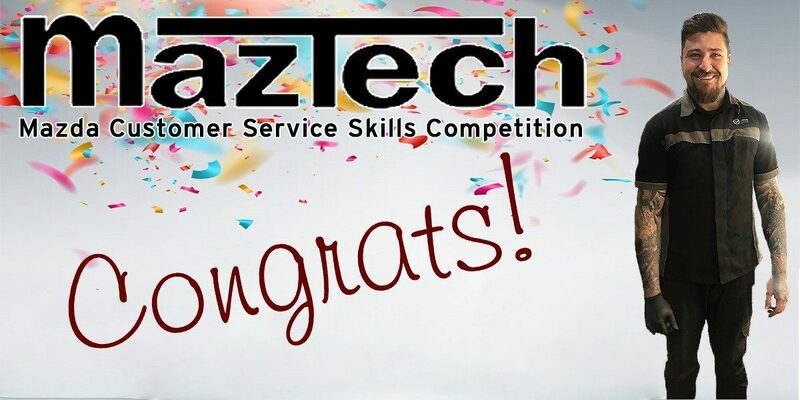 CONGRATULATIONS to Michael Barrett, for making it to the State finals for the Maztech Competition. Michael first started as a mechanic with Berwick Mazda in January 2007. “I have always had a passion for cars, and started out wanting to be a vehicle designer, ” said Michael. To begin, he thought it best to understand the mechanics behind vehicles to then pursue his dreams further. Fast forward 11 years and Michael is one of the Senior Mechanics here at Berwick Mazda and has decided that he loves getting his hands greasy while working on cars. His favourite part of being a mechanic is the Diagnostic aspect. He enjoys the challenge of figuring out exactly what the issue with a vehicle may be. We asked him a little about how the first stage of the competition was conducted and why he performed so well. “It was lucky that the test was based on Virtually Diagnosing the problem with a vehicle. Diagnosis being my favourite part made it a breeze.” Having been ranked in the top 8 in Victoria, Michael now looks forward to smashing the competition and representing Berwick Mazda Nationally.